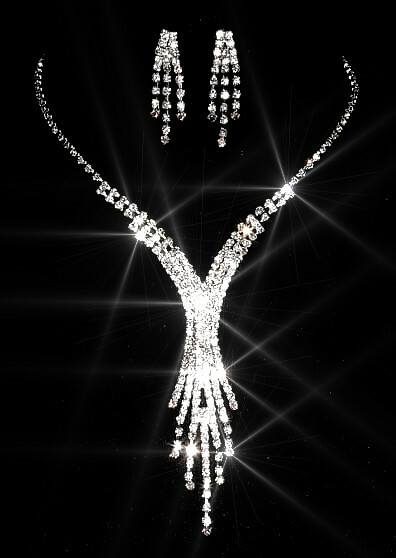 Surprisingly glamorous in a classy, Hollywood starlet kinda way, which is why, according to the designers, this Set has also become incredibly popular with brides and bridesmaids.. Just the right amount of razzle-dazzle to make a real good impression from literally hundreds of tiny rhinestones, which catch the light and reflect it big- time. The centrepiece of the Midnight House is 10cm (4") tall and the rhinestone-studded necklace is 32cm (12½") - 42cm (16½") long and adjustable. The earrings are 4cm (1½") tall. And the whole set has been plated in Sterling Silver.